Shanghai is enjoying some absolutely glorious spring weather right now, and since it’s not likely to last long, I’m trying to savor it while I can. I went for a walk after lunch today, passing fruit stands filled with mountains of newly arrived pineapples on every block I traveled. Though I’m not a big fruit eater, by the time I had reached the produce store closest to my apartment and saw a pile of pineapples next to the door there as well, I decided to stop for one. Chinese fruit vendors will prepare a whole pineapple for you, using what’s basically a lethally sharp vegetable peeler to remove the tough exterior spines with short, fast strokes. They then employ a curved, semi-tubular tool to cut channels in the pineapple meat, eliminating the roots of the spines. There were several other customers ahead of me, so after I picked out my fruit and paid for it, I got into line to wait my turn at the pineapple-prep station on the sidewalk. Just as the produce vendor was greeting me and picking up my pineapple to clean it off, a portly, smartly-uniformed chengguan officer strolled up, swinging a bottle of sweet iced tea in one hand and waving his other to get the vendors’ attention. Chengguan (which I wrote about for Dissent magazine last summer) are “urban management” officers, unarmed para-police responsible for enforcing laws related to hygiene, peddling, municipal appearance, and environmental protection. They are often thugs and don’t hesitate to resort to violence—which has resulted in the deaths of several street vendors over the past few years. 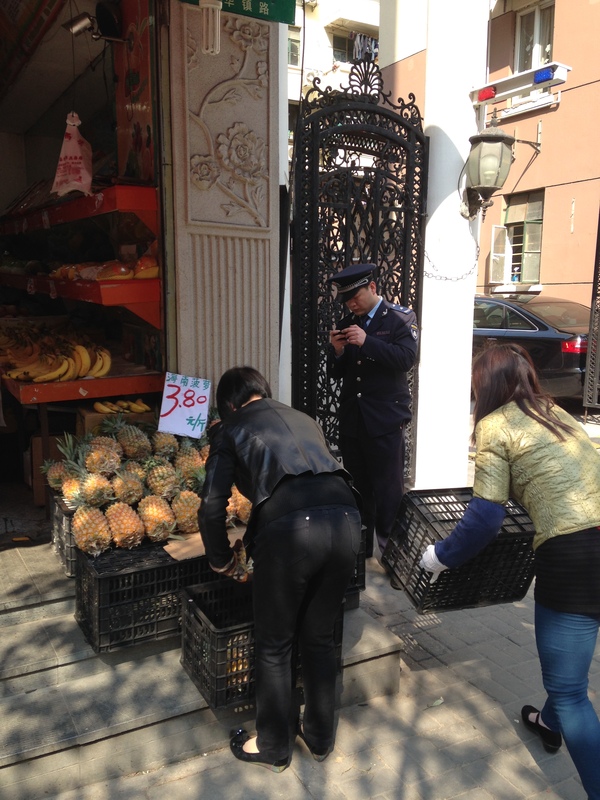 Women moving pineapples off the steps while the chengguan studies his cell phone. There was no physical violence today. The officer yelled for the two women running the produce stand to move their tables of pineapples and oranges off the shop’s steps, telling them that everything had to be within the walls of the store. The women had obviously realized that an attractive pyramid of fresh pineapples outside the entrance would lure customers in (it worked on me! ), but the chengguan wouldn’t permit it. He also spotted a few pairs of shoes airing out to the side of the steps (a very common practice here) and barked at one of the vendors to move them. She scurried over to the shoes and quickly gathered them up in her arms, while the other woman grabbed a crate and began stacking pineapples in it. When the crate was full, she pushed it under one of the tables inside the store. What had been an eye-catching display of merchandise only three minutes before was now dismantled, the pineapples shoved out of sight. After the chengguan saw that the female vendors inside were following his orders, he turned his attention to the male fruit-seller, who was preparing my pineapple as fast as he could. As I pretended not to listen, the officer yelled at the man for getting pineapple shavings all over the sidewalk (he did have a cardboard box to serve as a trash can, but often worked so fast that bits of pineapple skin went flying beyond the box’s walls). The produce vendor promised that he would clean the sidewalk as soon as he was finished my pineapple. He hastily scraped away the last few spine roots and shoved the fruit into a bag for me. “Thank you,” I said, but the normally friendly vendor just turned away and started gathering discarded scraps of pineapple from the sidewalk around his work station. 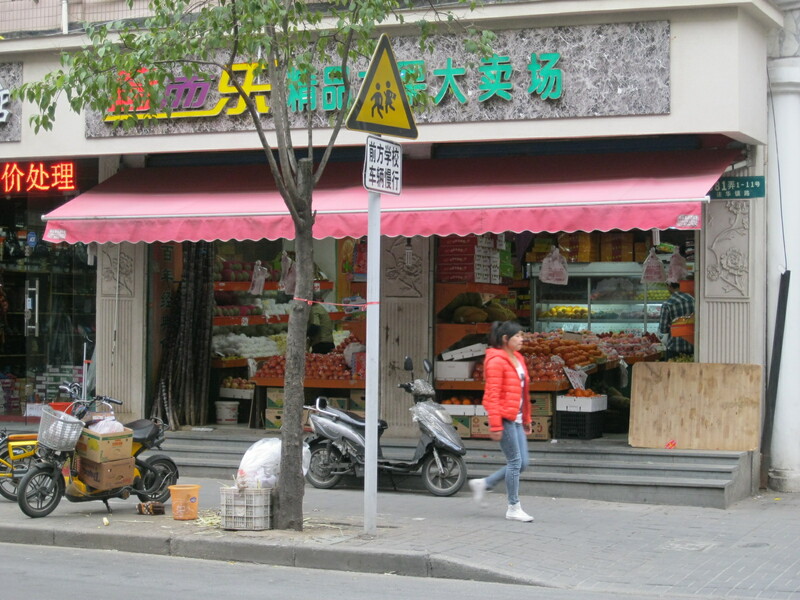 The chengguan leaned against the building, checking his cell phone and drinking his iced tea as the three produce vendors rushed to comply with his orders and I walked away. As I wrote in that Dissent article last summer, the chengguan send chills up my spine. That’s still true. I hate their arrogance and the pleasure they seem to take in bossing people around. I hate the harsh, demeaning way I hear chengguan yell at street peddlers when they don’t react to orders fast enough. And whatever minor violations my local produce vendors might have committed, they run a clean, well-maintained store that always looks nice—that’s why I shop there. If the chengguan really want to improve Shanghai’s appearance, my suggestion is that they patrol the sidewalks and make dog-walkers clean up after their pets. Pineapple peels, to be frank, are the least of our problems here. But dog owners are generally middle-class, while produce vendors tend to be migrants from smaller cities or the countryside. And from what I’ve seen over the almost 18 months I’ve lived in Shanghai, the chengguan only enforce the rules when they’re sure that the “rule-breakers” are from a weaker socio-economic position than their own. Curious to see how things had played out after I left the fruit store, I worked at home for a couple of hours and then walked back down to buy some apples. As I approached the shop, the chengguan officer was standing on the sidewalk opposite, still checking his cell phone every few seconds. Just at that moment, a small SUV with the chengguan crest painted on the doors drove up and honked. The officer climbed into the backseat and they drove away. 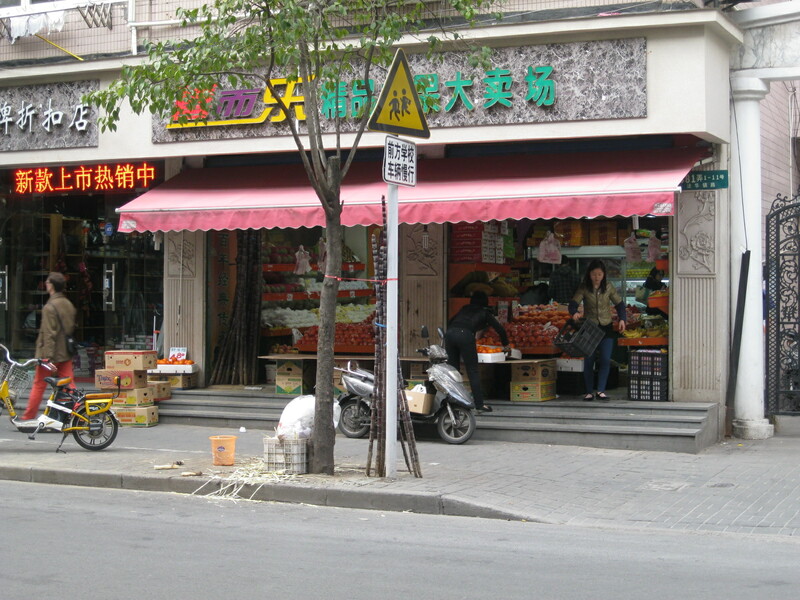 By the time I had picked out two apples and was in line to pay for them, the produce vendors had taken note of the chengguan’s departure and the women rushed to reassemble their pineapple and orange displays on the shop steps.